Mix shortening, margarine, peanut butter, sugar, brown sugar, and egg. Combine dry ingredients and blend them into mixture. Roll into balls and place on greased baking sheet. Dip fork in flour and create criss-cross pattern on cookies. Sprinkle with suar. Bake at 375 degrees for 10-12 minutes (until set, but not hard). 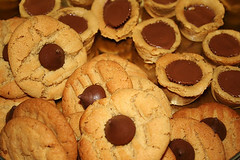 Place Hershey Kisses in center of warm cookie. be shy about downloading games digitally! item. If you can’t get anyone on the telephone, steer clear.